The best way we can move on from a defeat is to learn from it and not make the same mistakes. Easier said than done. And quite preachy at that. 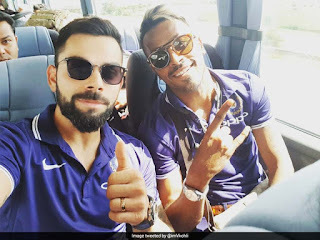 And from the pictures that are breaking the internet - the ones that Virat Kohli has posted on his Instagram all laughing and the usual thumbs up to a sign - it shows that they are not going to let the defeat in the first test match get to them. They did after all know that it was not going to be a walk in the park. Far from it. "Touchdown Joburg, what a City! Gearing up for the next one and very excited about it." is what he wrote. Kohli is aware that the batsmen have to step up now. While the bowlers did a fair job, the rest of the team need to pull up their socks and share the burden. They are the ones who failed while chasing what was a rather mediocre target. Pandya’s brilliant knock should knock some confidence and inspiration to the team. The seam movement at the pitch of Newlands, combined with Philander’s bowling attack took the men in blue apart. It was fast yet painful. News on the second test starting 13t January 2018. Dale Steyn is out. Heel injury. The Proteas have added rookie pacers Duanne Olivier and Lungi Ngidi to their attack. Four fast bowlers would be the pick that the South Africans would make. A wise choice seeing how well it worked in the first test match, especially. The same strategy would continue. While playing at home has tremendous advantages, playing to the strength is vital as well. Team India should use these factors while picking their eleven for the second test. India is not going to have it easy. The grounds get harder for them. They are not used to it. And there is the added pressure. Losing the first test. Playing in harsh conditions. Playing away from home. Playing on a pitch that is out to get them (at least in their head). Playing in Sri Lanka is not the same as playing in South Africa. The men in blue hopefully get this in time and play with their heads straight on. Driving through the line and hitting on the up with front foot planted down the track is fine in India. But on pitches overseas this is inviting disaster --- as unsafe as driving against the flow of traffic on a busy highway. Technique guru Sunil Gavaskar, having analyzed the problem, made this sharp comment: Without back-foot play, the batsmen will remain on the back-foot! The ground - Centurion. It is not as green as the earlier grounds. Brown means more bounce. Less for lateral movement. There is scope for seam movement as well. When the cracks appear, the bounce is likely to more inconsistent. My team. I want Murali Vijay along with KL Rahul as openers. Shikhar Dhawan can come in third. Kohli should step in fourth followed by C Pujara.Rohit Sharma and Ajinkya Rahane. Saha and Hardik Pandya are capable of handling from this point onward. Mohammed Shami and Bhuvneshwar Kumar along with Jasprit Bumrah complete the team.